1 While the people pressed upon him to hear the word of God, he was standing by the lake of Gennes’aret. 2 And he saw two boats by the lake; but the fishermen had gone out of them and were washing their nets. 3 Getting into one of the boats, which was Simon’s, he asked him to put out a little from the land. And he sat down and taught the people from the boat. 6 And when they had done this, they enclosed a great shoal of fish; and as their nets were breaking, 7 they beckoned to their partners in the other boat to come and help them. And they came and filled both the boats, so that they began to sink. 8 But when Simon Peter saw it, he fell down at Jesus’ knees, saying, “Depart from me, for I am a sinful man, O Lord.” 9 For he was astonished, and all that were with him, at the catch of fish which they had taken; 10 and so also were James and John, sons of Zeb’edee, who were partners with Simon. And Jesus said to Simon, “Do not be afraid; henceforth you will be catching men.” 11 And when they had brought their boats to land, they left everything and followed him. In Chapter Four Jesus preached in Galilee, his home–town of Nazareth and in Capernaum. He was well–received in Galilee, rejected in his home–town and had positive and negative reactions in Capernaum. In the opening passage of Chapter Five he encourages Peter to join him in his ministry. As the catch of fish indicates the future successful work will not be Peter’s own doing but will depend on Jesus. A careless reading might assume that this passage is between Jesus and Simon Peter. But that is not so. The verbs in verses 4, 5, 6, and 7 are all in the plural, implying that James and John were involved. The “two boats” are mentioned in verses 2, 7, and 11. “While the people pressed upon him” — The people were gathering around him and seeking to get as close as possible. He was being pushed and shoved gently but it was uncomfortable for speaking. “to hear the word of God” — To “hear the word of God” is a frequent expression in Luke’s Gospel (Lk. 5: 1; 6: 47; 8: 13–21; 11: 28) which identifies hearing the word with faith. When Luke mentions “the crowd” he refers to groups who are without faith. When they “hear” and “obey” he refers to them as “the people”. In this first verse he speaks of them as “the people” — they were listening to the word of God in a favourable and acceptable light. “He was standing by the lake of Gennes’aret” — is also known as the Sea of Galilee and the Sea of Tiberias. This is the single occasion where it is called the “lake of Gennesaret”. Gennesaret is the plain north–west of the lake and this is how the lake was given its name. 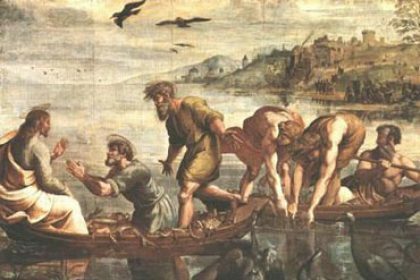 Luke writes about the lake frequently and associates it with the exercise of Jesus’ power. “And he saw two boats by the lake; but the fishermen had gone out of them and were washing their nets.” — Fishermen washed their nets after a night’s fishing. “Getting into one of the boats, which was Simon’s, he asked him to put out a little from the land.” — The Fathers, or early writers in the Church, saw in the boat that Jesus got into a symbol of the Church, called the barque of Peter. He taught the people from the boat and he continues to teach from the Church. There is a sense that each of us can see himself/herself as the boat from which Jesus teaches when we proclaim God’s word to those around us. “And he sat down and taught the people from the boat.” — Sitting was the official posture of one who taught. “And when he had ceased speaking, he said to Simon, ‘Put out into the deep and let down your nets for a catch.’” — Jesus speaks in the singular to Simon to “put out into the deep” but he speaks in the plural “let down your nets for a catch”, indicating that there were others in the boat with Simon. The duty of leading and guiding was Peter’s; that of “fishing”, of mission, was common to all. “And Simon answered, ‘Master, we toiled all night and took nothing!’” — Simon addresses Jesus as “Master”, Luke’s preferred title to “rabbi” which he never uses. Luke uses “Master” seven times as an address for Jesus. Simon makes the point that if fish are not biting at night there is no hope of their biting in daylight. The opportunity is hopeless. “‘But at your word I will let down the nets.’” — Simon having made the point that there are no fish around and there is no point in throwing out the nets, humanly speaking fishing is hopeless, shows his obedience to God’s word by saying that because Jesus asks him to do it he will throw out the nets — “at your word”. As an experienced fisherman Simon knew that he was doing the hopeless but because Jesus wished him to do so he would obey. “And when they had done this, they enclosed a great shoal of fish; and as their nets were breaking, they beckoned to their partners in the other boat to come and help them. And they came and filled both the boats, so that they began to sink.” — This is a description of the magnitude of the catch. “But when Simon Peter saw it,” — Simon is here, for the first time, referred to as “Simon Peter”. “Peter” is added to show his link to the Church. The extraordinary catch symbolises the growth of the Church under the leadership of Peter. “he fell down at Jesus’ knees, saying ‘Depart from me’” — Simon Peter is aware that he is in the presence of divinity and he is filled with fear. Examples of Old Testament characters who reacted in a similar manner in the presence of the divinity are Abraham (Gn. 18: 27), Job (Jb. 42: 6) and Isaiah (Is. 6: 5). “for I am a sinful man, O Lord.’” –Simon Peter is filled with humility and an awareness of his own sinfulness and unworthiness in the presence of the all–holy. 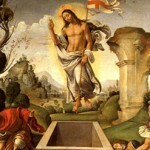 Simon’s immediate attitude is to separate himself and Jesus, the sinner and the divine. “Depart from me”. Jesus does not obey. He has come for sinners and this is the first he has chosen to join him. Simon Peter addresses Jesus as “Lord”. This word would have been chosen because he saw divinity responsible for the catch. It would not refer to Jesus with his resurrected title. Peter was aware that the all–holy God was involved in the catch of fish and that it was miraculous. Being in the presence of God made him aware of his sinfulness. Nevertheless there is a progression in Simon Peter’s reference to Jesus: first he was merely “Master”, then he became “Lord”, an indication of his faith. “For he was astonished, and all that were with him, at the catch of fish which they had taken; and so also were James and John, sons of Zeb’edee, who were partners with Simon.” — Astonishment can be identified with religious awe on witnessing the miraculous catch of fish. That there were others with Simon Peter is expressed here: “and all that were with him”. There could be four persons in each boat. Those in addition to James and John are not mentioned by Luke though they could have included Andrew, another who became an apostle. Luke places this episode of the three apostles witnessing the miracle of the multiplication of fish on a plane with the raising of the daughter of Jairus, the transfiguration and the agony in the garden. In Luke’s view it was of extra special importance. It was not just a miracle but Jesus revealing himself and calling the first three apostles to what he described as the vocation to give life to people. “And Jesus said to Simon” — In this passage Jesus has addressed only Simon and ignored the other disciples, James and John and some others who are referred to but not mentioned. “‘Do not be afraid’” — Simon’s “fear” came about because he was fully aware that he was in the presence of divinity and he was an unworthy sinner. “henceforth’” — “Henceforth” or “from now on” (JB translation) is a word used by Luke (Lk. 1: 48; 5: 10; 12: 52; 22: 18, 69) to denote a new beginning in the history of salvation. “you will be catching men.’” — Jesus told Simon to launch into deep waters and put out the nets for a catch. The result was beyond all reckoning. Now he tells him that he will catch men and the implication is clear, the results will also be beyond all reckoning. The Greek expression implies that they will continue to catch men and give them life. The Greek word used here is very special. When fish are caught, they die. However the word used here implies that they live. Jesus is telling Peter that he will catch men and give them new life. The expression in English — he took bait, hook and sinker — implies that the person who did so lives on and does not die immediately but has a new outlook on life or a particular point. “And when they had brought their boats to land, they left everything” — A regular feature in Luke is that Jesus must suffer (Lk. 9: 22; 13: 33; 17: 25; 22: 37; 24: 7; 26: 44). In step with this is that disciples must be prepared to give up everything if they are to follow Jesus (Lk. 5: 11, 28; 9: 23; 12: 33; 14: 26, 33; 18: 22). Note that in this instance, the disciples never had such a catch of fish and they leave it without selling it. That could very well have been a tremendous sacrifice at the end of their careers. It is more probable that they looked on the greatest moment and catch of their whole fishing career as nothing compared to what they really saw — God’s power in this miracle and the revelation that he touched them personally by inviting them to join with him in the work of universal salvation and redemption. “and followed him.” — They became his disciples. This was a total and radical decision. They came with absolutely nothing. Jesus had just made them economically rich and secure for life. They walked away from it all. In the Application of this commentary the purpose is to present one or two of the most important points in the Gospel reading. The first most important point always is the teaching about Jesus. A quick glance at the current passage might give the impression that the teaching is about Simon Peter which would be a mistake. Jesus is central to the passage. The first point shared is that Jesus is a teacher of the word of God, his prophetic mission. That is what attracts him to people. They are drawn to him so that they may know God. Simon called him by his title among the people, “Master”. Such crowds gathered around him that they made it almost impossible for him to teach. This is why he asked Simon for the use of his boat. In this way he taught a lesson not perceived at the time but understood some few years later. Simon’s boat became known as the “barque of Peter”, the Church. Jesus continues to proclaim the word of God from the Church. The symbol deepens as the story progresses. Jesus tells Simon to launch out into the deep waters. Jesus is in control; he issues the instructions. He places Simon in charge over the other crew members. Jesus needs Simon; Simon needs the others. When the nets are played out it is not Jesus who catches the fish. Simon and the other fishermen do that. Recognising “the Holy One” as the archangel referred to Jesus at the Annunciation, Simon drops to his knees and declares himself to be an unworthy sinner. Luke subtly changes his name to Simon Peter. Simon, captain of the barque of Peter, has his name changed to Peter. He is recognised as Head of the Church. The message is clear. Jesus wishes to “catch” and save people by means of people. He has the power and could do so on his own but his respect for people is such that he wishes them to collaborate with him in this work of redemption and salvation. Jesus shares his life and mission with others. As the Explanation points out, the Greek word for “catch” people is used only once elsewhere in the bible. It has the meaning of catching and allowing to live, to give life. This becomes Peter’s divine mission, he is to collect people and give them God’s life. Only Jesus could even dream of allowing a publicly–confessed sinner to play such an essential role in the sharing of divine life to others. Simon was, with the other fishermen, washing the nets after an all night fruitless effort to catch fish. He would have been very tired and was certainly not paying too much, if any, attention to Jesus proclaim the word of God to others. That is, not until Jesus asked for the loan of his boat. There was no problem in letting Jesus sit in the boat and talk to the people. But when Jesus told him to go out into deep waters and pay out the nets, Peter became hesitant. Nevertheless he had faith in Jesus who had cured his mother–in–law the evening before and had dined in his house, so he, perhaps reluctantly, agreed. Peter’s true nature revealed itself on witnessing the miracle of the catch of fish. There was no self–praise for what he had caught. He was humbled and filled with awe. He fell on his knees and confessed his sinfulness in the presence of the divine. Luke uses this incident to inform us that Jesus appointed him “Peter”, the Rock, the Head of the Church. Jesus made him a promise — “henceforth, you will be catching men”. Jesus made him a pledge that from then onwards Peter would have an essential part in Jesus’ own mission. Peter trusted the word of Jesus and, with nothing but trust, followed him, literally to the death.